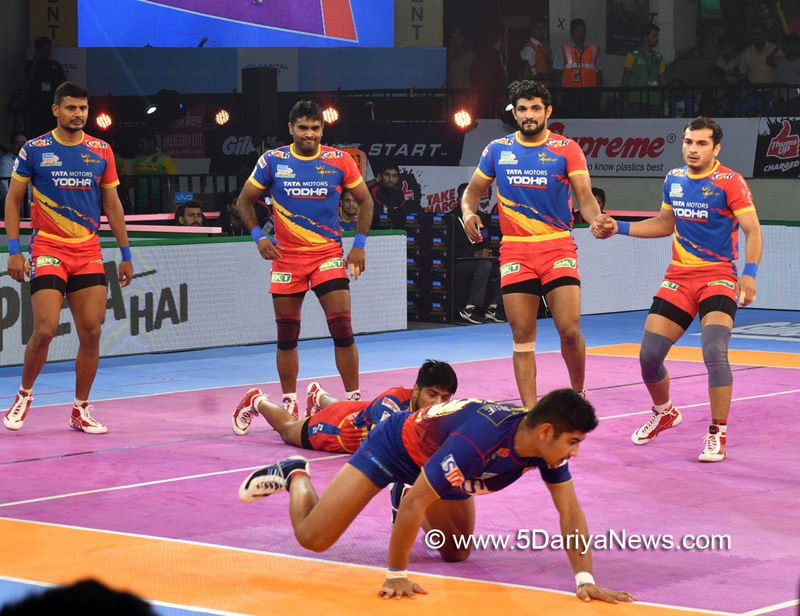 UP Yoddha registered their third win in the ongoing edition of Pro Kabaddi League (PKL) as they defeated Dabang Delhi KC 38-36 in an inter-zonal challenge match here on Sunday.The contest saw four raiders, Naveen Kumar and Chandran Ranjit for Dabang and Prashant Kumar Rai and Shrikant Jadhav for UP Yoddha, achieving a Super 10. Jadhav's efforts turned the match on its heels as he got Ravinder Pahal and Joginder Narwal in the dying moments.Naveen and Ranjit raided well with bonus points and touch points regularly as Delhi took a 6-3 lead by the 4th minute.UP started having great successful tackles on the raiders of Delhi with Narender and Nitesh Kumar making great tackles on Naveen and Chandran Ranjit. With the raiders out on the bench, the team started to crumble. Prashant Kumar Rai inflicted an all out on Delhi in the 12th minute with a super raid on Ravinder and Ranjit to take a lead of 12-14. Later, Jadhav raided to take Ravinder, Viraj Landge and Vishal Mane as UP extended the lead to 21-14.UP ended the first-half with a 25-17.The second-half saw Delhi trying to make a comeback with strong defensive display. They took regular tackle points to reduce the difference to 5 points in the 21st minute of the match to make the issue 20-25. Azad came in as a substitute and helped UP Yoddha inflict a super tackle on Naveen after they were reduced to two men in the 26th minute. Ranjit scored two touch points in the 27th minute on Amit Narwal and Nitesh Kumar as the score read 31-27 in UP's favour.With touch and tackle points being grabbed by Dabang Delhi, they equalized the score by the 30th minute. The game continued to be a close affair till the 36th minute.The 40th minute raid by Jadhav saw Delhi lose both their corners and hence lost the match 36-38.